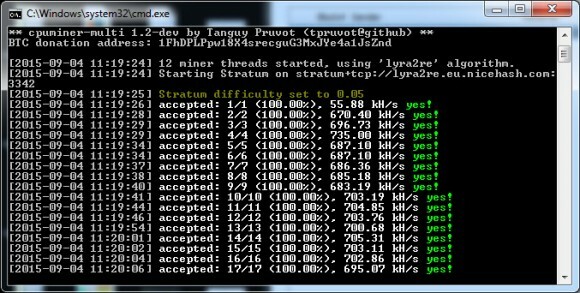 Some people have asked is there is a CPU miner for Decred (DCR), well it turns out there actually is – a version of tpruvot’s cpuminer-multi CPU miner (source) with added support for the Blake-256 14-rounds algorithm used by Decred and support for getwork as the coin does not shave support for stratum for the moment. We have compiled a Windows 64-bit binary for the miner that you can download and try below if you are interested in mining Decred with CPU, although there might not be much point in doing so based on the performance you should expect to bet getting out of the CPU miner. Currently Decred (DCR) has a very high network difficulty and slow block times, so it is not easy to mine with GPU, let alone with CPU. 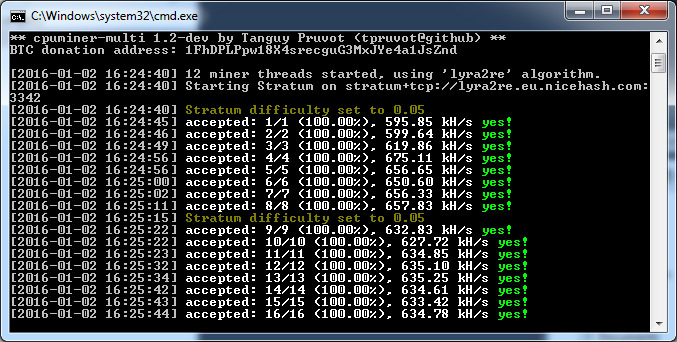 Trying out the CPU miner we are getting around 1.55 MHS per thread on a Intel Core i7 5820K (6 cores 12 threads) for a total of about 18 MHS versus 1.2+ GHS from a GTX 970 or 280X GPU. Still if you want to experiment CPU mining Decred (DCR) you can do so with this miner. 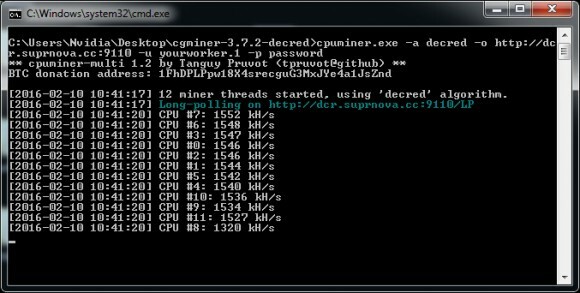 We have not released binary updates of the cpuminer-multi CPU miner fork from tpruvot with multiple algorithms support (source), so here is an up to date version compiled for Windows. This is the most functional fork of cpuminer that comes with support for the largest number of algorithms and a lot of optimizations for them to get the most performance out of your CPU. Do note however that some dedicated forks of cpuminer for a specific algorithm may still provide better performance, but if you want flexible solution with many algorithms supported then cpuminer-multi is the choice. We have compiled an up to date Windows binary from the latest source that comes with some fixes and improvements for various algorithms as well as support for some new algorithms such as bastion, scrypt-jane, sib and yescrypt. If you have some spare CPU power that you want to use for mining then this is the miner you’ll need, do note that we have compiled our Windows binary with Visual Studio 2013 and for 64-bit Windows. It has been a while since there has been an official release of the cpuminer-multi fork from tpruvot though he is working on his cpuminer-multi CPU miner with multiple algorithms support (source). This is the most functional fork of cpuminer that comes with support for the largest number of algorithms and a lot of optimizations for them to get the most performance out of your CPU. Do note however that some dedicated forks of cpuminer for a specific algorithm may still provide better performance, but if you want flexible solution with many algorithms supported then cpuminer-multi is the choice. We have compiled an up to date Windows binary from the latest source that comes with a lot of fixes and improvements regarding Lyra2RE and the new Lyra2REv2 algorithms as well as some other changes and extra functionality. If you have some spare CPU power that you want to use for mining then this is the miner you’ll need, do note that we have compiled our Windows binary with Visual Studio 2013 and for 64-bit Windows.